"Best Offer lets you offer the seller a price you're willing to pay on Buy It Now items. The seller decides whether to accept, reject, or counter your offer." And, it explains, "The seller has 48 hours to decide whether to accept or reject your offer, or suggest another price. If they choose not to respond to you in that time, or if the listing ends before they respond, then your offer expires." 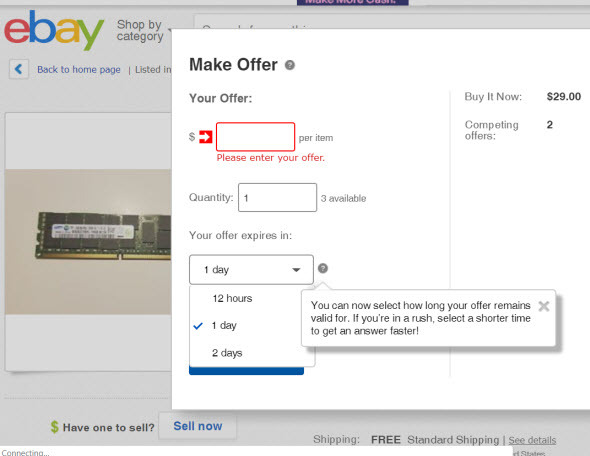 A reader sent us a link today to an eBay listing where Best Offers are accepted that shows the additional options; clicking a Help icon displays a pop-up that explains, "You can now select how long your offer remains valid for. If you’re in a rush, select a shorter time to get an answer faster!" It offered buyers the option to limit their offers to 12 hours or 24 hours. He described his reaction from buyer point of view: "As a buyer I view this as a small benefit; though I would prefer the option to specify a number of hours less than 12 (though I'm sure many sellers would not care for that option at all)... 48 hours can seem like an eternity when you're waiting around for a seller response." He also reminded us of the "Name your price" feature eBay had hinted at during the eBay Open seller conference in July - there's more about it in this August 5th Blog post. Let us know what you think of the new Best Offer durations from the seller point of view - good or bad? PS: I also found this post which should be of interest. @toolguy - Selling at a swap meet is worlds away from selling on eBay. First of all, the seller is sitting (or standing) right in front of you, He's not at his primary job with limited time on the computer (or cellphone) for personal business. The seller, if he's done swap meets for any length of time, can pretty much tell if you are a serious buyer or just trying get something you are going to try to resell somewhere else. And oftentimes, the price a swap meet seller is willing to accept depends on if he wants to drag all his unsold items back home. As for the "customer is always right," I think anyone who's been scammed by an online buyer would heartily disagree with you. That phrase died when most of the mom and pop brick and mortar stores did. I've been scammed enough that my philosophy is "a customer is a scammer until proven otherwise." "a customer is a scammer until proven otherwise." 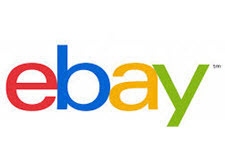 I prefer to think as customers: "as good as gold until proven otherwise"
I can count on 1 hand how many times I've been scammed on eBay over the past 19 years & 35000+ transactions. . . .
My only problem with 12 hours is if there's a time difference. For example a buyer in say China may send an offer at 3am your time. I think 24 hours is the correct window although anyone SHOULD be able to respond in 12 if you sell online. This change means absolutely nothing to me. I've had "Best Offer" on my listings since it was introduced (I'm thinking around 2003-2004?). I can't think of any reason why this would change anything. 48 hours is fine. The amount of "accepted counteroffers" is almost 0. If I'm asking $100, and someone offers $40, and I counter at $75 or $80, there's maybe a 1% (or less) chance that the person will accept the counteroffer. Maybe a 10% chance that they'll give another counteroffer. And mostly they go away and I never hear from them again. I sell about 50% of my counter offers. When I have an item up for $100 and someone offers me $40 I don't respond! eBay buyers are like fish, you have to reel them in slowly. More bait in the water the more fish you catch. With auctions you never know how big or small the fish will be. Just follow the fishing rules and you can feed the family. . .